Have I ever told you just how smart my cats are? They are very smart. Anyone who tells you animals are thoughtless inanimate beings just hasn’t paid attention. I am allowed to live with two cats. The dark skinny one, Simba, is twenty years old. 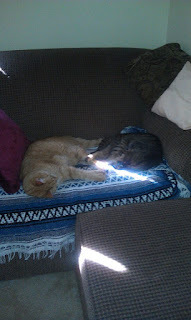 The fat orange one, Buddy, is nineteen years old. Who knew they would live to be so old! I have lived with several cats previously, they all seemed to have run under moving cars within a month after my spending the money to have them spayed. These two are exceptional. My two cats actually reason, they figure things out. I can see it in their expressions and witness the results. Doors shut? No problem, Simba stands on his hind legs and jiggles the handle while Buddy leans his shoulder into the door to swing it open. Have to lock the bathroom door, otherwise they think they need to supervise! They are a management team! When let outside, they both know they need to come home when I whistle for them. If they aren’t right there in our back yard, they will call back to me so I know to wait for them. Simba is a bit of a priss. He won’t “go” outside. If he is outside and need to go; he will demand to be let back in, use the litter box, and then demand to be let outside again. Buddy isn’t quite as fussy. A few years ago, the discharge pipe for our furnace humidifier got jostled loose. Those two cats sat and stared at the dripping water until we figured it out. Thankfully, we noticed before there was too much damage. Our immediate neighbor has a cocker spaniel. Esther. Chubby little black thing that barks at us if she can hear us in our own home. She barks and snips and growls and carries on. Obnoxious little thing. It’s owners finally bought a bark collar. Early in the morning, Esther is allowed outside without it. Depending on how many of the other neighbors are up and about for her to bark at. Early morning is usually a short backyard bark session. During the day, Esther is allowed outside with her bark collar on. She seemed to be fairly quiet during the day, most days. Since I am home during the day, right now, I have noticed the boys wanting to go outside in the early afternoon. Bud wanted out, even on hot days. That’s unusual for the big fella wearing a fur coat! Two days ago I let them outside with me and I sat down on the upper deck with a cool iced tea. (typically Esther leaves me alone if I am quiet up there) Buddy, who I now realize is an instigator, made sure he walked along our fence line. Esther, with her bark collar on, ran along on the other side of the fence. Her small plaintive yips were sorta music to my ears! Buddy walked for about ten feet, then did the ultimate slap in a dogs face, he laid down! Simba, then decided to walk over to Bud. Esther dodged back and forth and back and forth, wanting desperately to bark and snarl. Then as she decided it was futile, she began to walk away, Buddy got up and walked a little more along the fence line. Simba joined me up on the deck. Esther’s yips and yaps became apparent that she was beginning to be in pain, her people came out to investigate (finally). I waved, smiling, and said "Hello". I get to live with smart cats. ROFL That is typical cat behavior. I have two German Shephards, a dacshund and a cat. No prizes for guessing who the bossis! Lol! very smart cats...poor Esther! Enjoyed the post! Thank you all so much for posting your comments - I sure do enjoy reading them! That made wonderful reading :) Cats are real smart, no two opinions on that. Thank you! I love them as much as they drive me nuts!